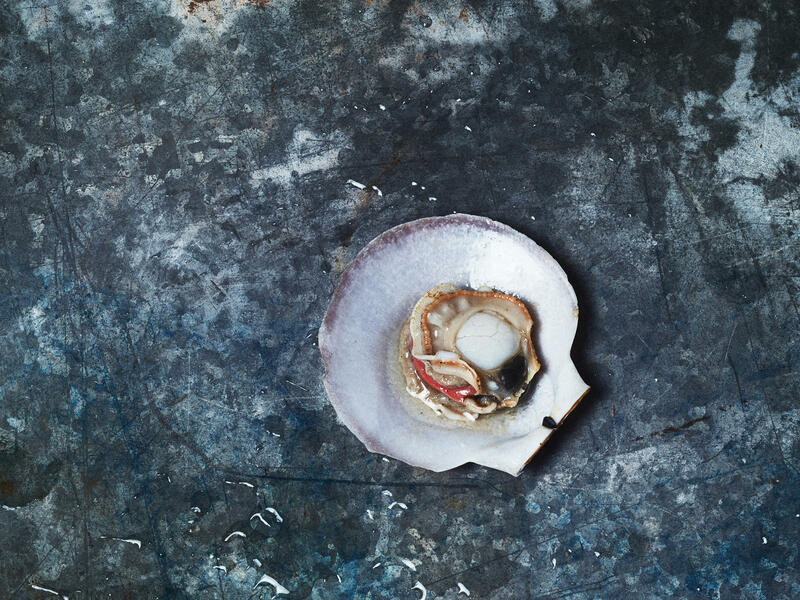 This dish features a scallop in its shell. Bivalves, like scallops are threatened by rising ocean acidification. Wist left it in the shell, so people would think of it "as an animal and not just a scallop on a plate." 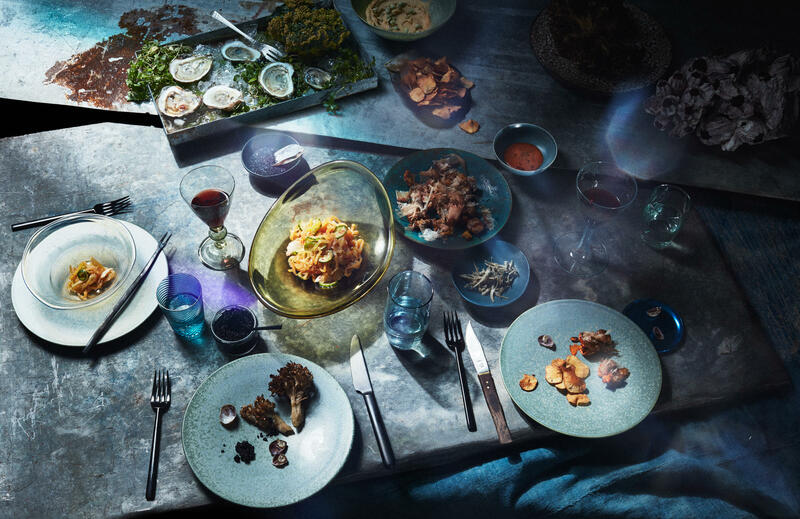 Allie Wist's "Flooded" dinner spread includes burdock and dandelion root hummus with sunchoke chips; jellyfish salad; roasted hen of the woods mushroom; fried potatoes with chipotle vegan mayo; salted anchovies; and oysters with slippers. Most of these are foods that might be more resilient to climate change and, therefore, what we could be eating in the future, Wist says. The fishing village of Nueva Venecia is situated in a lake deep in the marshlands of northwestern Colombia. The marshlands could be inundated with ocean water by 2100, if sea levels rise by 3 feet or more as projected by scientists. 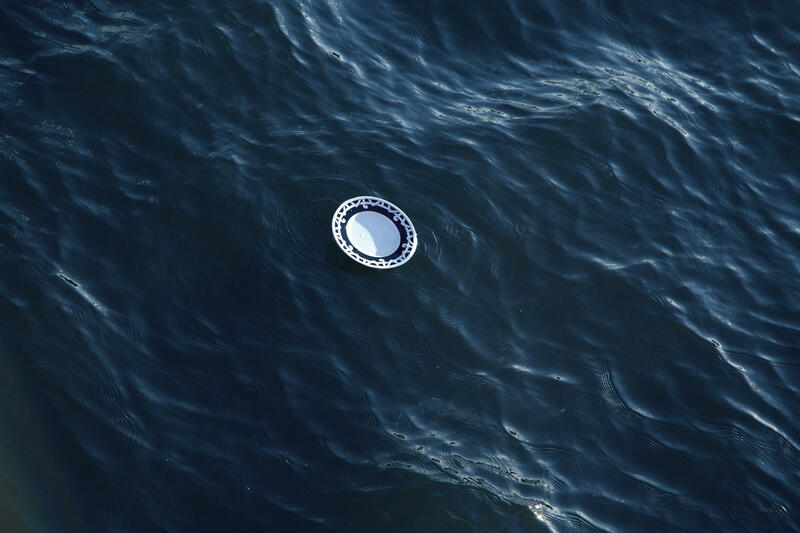 A dinner plate floats in New York City's East River. "It said something about just getting swept away and belongings being flooded," says Wist. But it also implied "us persevering... and eating dinner despite that." Left: Mollusks in broth with mustard greens. Mustard greens are hardy plants that could withstand climate fluctuations. Right: A DIY method for desalinating ocean water for cooking and drinking. Left: Mushrooms have incredible potential as a future food source and can absorb toxins from the soil, says Wist. Right: Carob agar-agar pudding with whipped cream. Carob is substituted for chocolate, as cocoa production is threatened by rising temperatures. Kombu, kelp, oysters, clams and other mollusks. 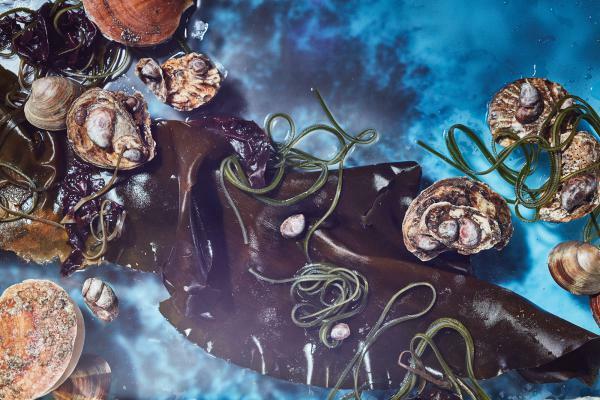 If we farm seaweeds like kelp and kombu and protect bivalves, they could become a reliable source of food in the future, especially for coastal communities, says Wist. Wist has been following news about climate change with a growing sense of urgency. Global temperatures have risen in recent decades and extreme weather – droughts, floods, hurricanes – is more common. Sea levels are rising, causing coastal erosion and flooding and even the disappearance of small islands in the South Pacific. Our oceans are becoming more acidic from dissolved carbon dioxde, hurting marine life. And, in some parts of the world, farmers are struggling with unpredictable growing seasons. Climate change has "become this future vision that's right in front of us," Wist says. But the issue is a politicized one in the United States, she says. Many people don't believe climate change is real. And many find it difficult to understand, because it's too abstract. "I felt this need to subversively convince people," Wist says. "I wanted to hook them more emotionally, with something they can relate to." So she chose food. "It is so integral to how we see ourselves and how we live every day," she says. Climate change is already having an effect on food production. In 2011, a study in Science found a small, but measurable decline in the world's wheat and corn production. As global temperatures rise, some places will become more favorable for agriculture, while many others will become too hot and dry to grow crops. Extreme weather will also influence food prices, as we saw in 2010-2011, when drought in some parts of the world and unusually big cyclones and floods in others led to a spike in wheat prices. Warmer ocean temperatures have and will continue to affect fisheries. All this means we might be forced to change what we eat in the coming decades, says Wist. People "have to start to realize that their daily activities could change, will change, because of this thing that they consider abstract," she says. Wist and her team, fellow photographer Heami Lee, food stylist C.C. 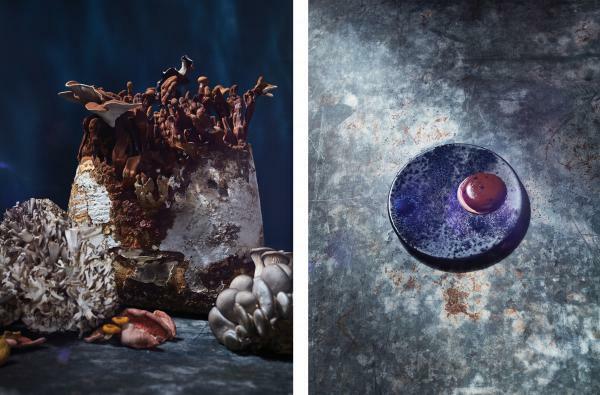 Buckley and prop stylist Rebecca Bartoshesy, started out by making a list of foods that scientists think "are either threatened by climate change or would be more available in an era of climate change," she says. They chose to anchor the essay in New York and New England to think more specifically about the kinds of food and eating habits that would have to change. Rising sea levels put coastal cities like New York, where Wist now lives, at a greater risk of flooding. That means in the not-too-distant future, residents might have to turn more to the ocean for food, says Wist. So her fictional menu includes an array of foods harvested from the sea. Bivalves, for example, play a key role in protecting the ocean environment, by filtering out pollutants. But they are threatened by climate change – the increasing acidity of ocean waters is eroding their shells. If we can save bivalves, they could become a good source of food in the future, Wist suggests. Wist says they chose mustard greens to serve alongside the bivalves on her menu because the hardy plants "can survive volatility in climate." And Wist thought about what might be in our glasses as well as on our plates. 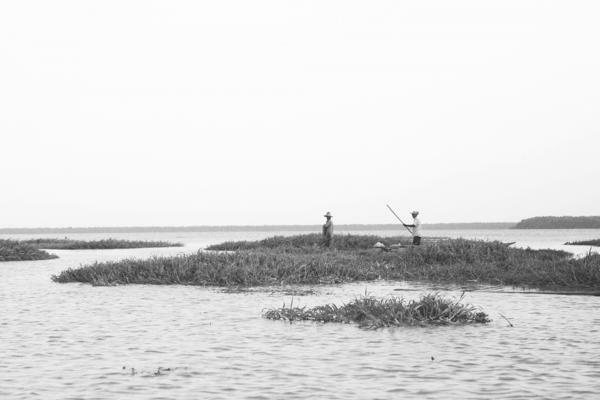 According to the U.S. Geological Survey, rising sea levels are likely to contaminate ground water. "I don't think anyone thinks about it, that we might have to desalinate ocean water in order to have drinking water," says Wist. Some countries, especially in the Middle East, already desalinate ocean water to provide more fresh water to their citizens, but Wist envisions the use of an at-home method involving a bowl, a rock and plastic wrap. When it gets too hot or dry to grow crops, we could turn to mushrooms for food, too, suggests Wist. They grow in all sorts of environments and can even detoxify soil. The picture on the right above, depicting a pudding made with carob and an algae-derived gelatin called agar-agar, is one of Wist's favorites. It forces viewers to "acknowledge that chocolate's being replaced," she says. It's a reality cocoa farmers in West Africa are already facing. "West Africa is thought to rise by about two degrees in the next 100 years," says Wist. "It will be too hot, too dry for cocoa production." And carob, which is less vulnerable to climate change, may be a good substitute. 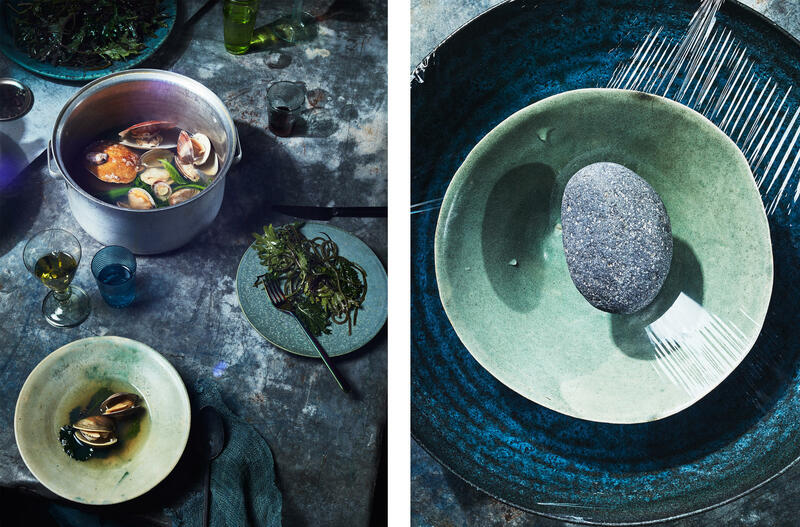 Another major ingredient in these recipes is seaweed. A recent study has suggested that seaweed farming could be a good source of nutrition, as well as help mitigate climate change. "Seaweed can absorb five times as much CO2 as land plants," says Wist. "I was really inspired by that research and thought what if someone did that? What if we started farming this more earnestly?" "Part of this [essay] is dystopic," says Wist. "Because we're losing all these things, and that's bad." But part of it is utopic, too, she says, because it shows how human creativity can help us find alternative sources of food. You can see Wist's entire essay and some creative recipes for the dishes above on her website. Rhitu Chatterjee is an editor with @NPRFood. You can follow her on Twitter. What do you get when you combine 20 miniature movie sets, three-dozen puppets, a string quartet, three turntables and five video cameras? Listen to WLRN's Alicia Zuckerman discuss the 10th year of the Knight Arts Challenge with Victoria Rogers, Knight Foundation Vice President for Arts, and hear Roger's tips on how to make an application stand out. Art in Islamorada tends to focus on the subjects you might expect from a Florida Keys village that bills itself as "the sportfishing capital of the world." Popular subjects include the game fish that people pay thousands to pursue in Florida Bay and the deep Atlantic, as well as the palm trees and subtropical sunsets.